Yesterday’s blog post gave a little bit of background about Bart Hill and the Little Wise Guys. Now here are some thoughts about our latest installment, page 228, which is part 2 of the “Time Troubles” story that Josh Burnett is drawing for us. *On the previous page, Bart was talking about World War II, so when he says “the next six years” in Panel 1, that’s your cue that this story is set in 1951. That’s the year that Bart stopped appeared in Daredevil Comics, so obviously that’s when he left Earth and ended up at Swann Castle. *When Bart says “I’d become a mentor to some neighborhood kids,” that doesn’t really acknowledge how prominent these characters, the Little Wise Guys, were in his comic. They were his supporting cast until, eventually, they became the leads and he became the supporting character. More on that in a bit. We didn’t have enough room to go into a lot of detail on the Little Wise Guys, but Josh really brings them to life on this page. *When you introduce characters in a comic, it’s important to work their names into the dialogue, so the reader knows who they are. I considered doing that here, with the Little Wise Guys, but I had a ton of information to fit into the middle row of panels, so I decided not to worry about their names. Later I felt bad about that, so I asked Josh to label them all. I think the captions work fine, except for Pee Wee, since there’s already two captions and two word balloons in that panel, and it ends up being crowded. Sorry! *I had so many ideas for this comic, and I had to cut so much to fit it all into 6 pages. For instance, I originally wanted to show all these time disturbances happening throughout the city but, good lord, that would have taken up at least a page, and wouldn’t have featured our lead character. It was hard to let go of things, but in the end the comic is much stronger because I had to focus. Now I like how dense with information this middle row of panels is, simultaneously introducing the Little Wise Guys and listing off three strange events. *In a modern comic, the heroes would realize there’s a disturbance in time because a bunch of dinosaurs and a horde of barbarians would appear in a blinding flash of light in the middle of a city and start killing people. Back in the olden days, comics were more chill. This seems accurate to me, that the signs of time trouble would be, like, outdated newspapers and confused pilgrims. *As I mentioned earlier, the Little Wise Guys gradually took over the Daredevil series, until it was mainly focused on them, with Bart Hill in a supporting role. 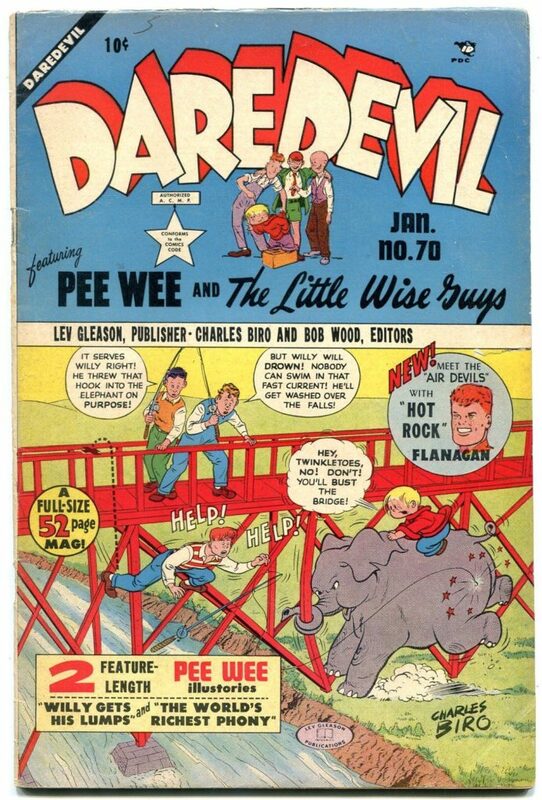 Finally, with issue 70, Bart was dropped from the series, and it became Daredevil Comics Featuring the Little Wise Guys. 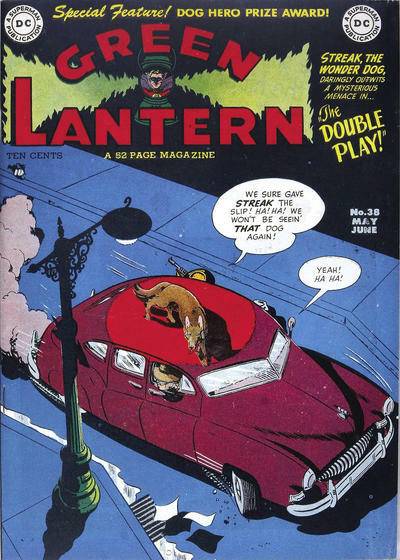 The series went on this way for almost seven years, ending in 1956 with issue #134. 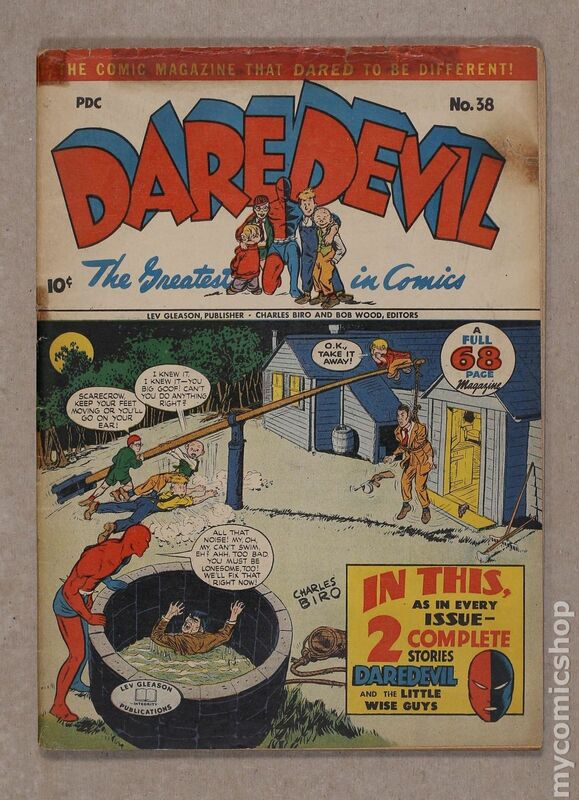 *It may seem weird that Daredevil got written out of Daredevil Comics, but by the 1950s the super-hero fad was mostly over, and other genres, like crime and horror, became more popular. The only costumed heroes whose series continued publication were Superman, Batman, and Wonder Woman. All of the others, including big names like the Flash and Captain America, were cancelled. *And if you think it’s embarrassing for a bunch of kid sidekicks to take over your comic, what about Green Lantern, whose dog took over his? *You may be wondering, was Professor Anachronis a real Daredevil villain from this time period? Absolutely not, my friend. Bart Hill and the Little Wise Guys never dealt with mad scientists. Their villains were much more grounded in the real world. I’ll go into more detail on this point in a future blog post. *For the last panel, I wrote in the script, “Bart’s now pulling open his shirt, revealing the Daredevil costume underneath.” This is a dramatic moment you often see in super-hero comics. Josh sketched it out and realized it wasn’t that dramatic—when Clark Kent pulls open his shirt, you see a big S; when Peter Parker opens his shirt, you see a spider; when Bart Hill opens his shirt, you see . . . a vertical line. The moment doesn’t really work without the iconic symbol. Josh wisely suggested showing Bart pulling on his mask instead.